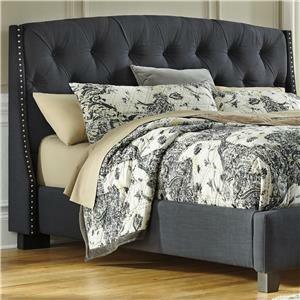 Create a modern bedroom with this queen bi-cast headboard bed. 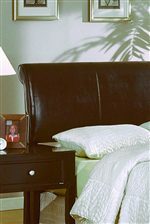 It features a dark brown bi-cast upholstery that will provide a soft headrest for your bed. The top features a sleigh curve adding a stylish touch. The Barlow Full/Queen Bi-Cast Upholstered Headboard by Crown Mark at Household Furniture in the El Paso & Horizon City, TX area. Product availability may vary. Contact us for the most current availability on this product. Finish Dark brown finish. 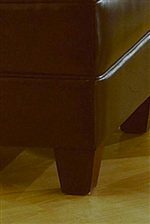 Each piece of furniture is handcrafted using imported Asian hardwood and veneers. Handles & Hardware Solid metal hardware. Case Detail Sleek and smooth lines. Drawer Suspension Wood on wood glides with drawer stops. Case Construction The collection uses a combination of selected hardwood and softwood solids, veneers and wood and/or simulated wood products. The Barlow collection will bring a chic and contemporary vibe in to your home. It features bi-cast upholstered pieces in a rich dark brown finish. A bi-cast headboard, armless chair and bench are featured with sleek and smooth lines and modern appeal. Create a bedroom or living room seating arrangement that is stylish and comfortable with the Barlow collection. The Barlow collection is a great option if you are looking for Contemporary furniture in the El Paso & Horizon City, TX area.